Alan E. Elsass, waits for his dog Precious Babe to return a stick while camping at the Lake Loramie State Park campground Friday, April 12. 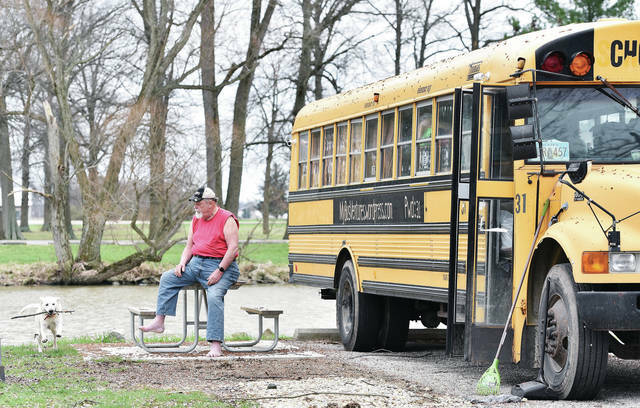 Elsass sold his house in Decatur, Ill., and bought a school bus Feb. 4, 2016. On March 6, 2016, Elsass got into his school bus and started traveling across the U.S.A.. Elsass has now been to 49 states (Hawaii being too expensive) in his bus along with his service dog Babe. Elsass grew up in Waynesfield, Ohio. Elsass has a blog of his travels at mybusventures.wordpress.com. The password is 31. Elsass plans on leaving the campground on Sunday, April 14.